The number of initially planned 48 training sites has been reduced to 37 and the seating capacity of two out of 12 stadiums selected to host the 2018 World Cup matches has been slashed by some 22%. Russia has introduced changes to the program of its preparations for the 2018 World Cup, in particular reducing the number of training sites for the upcoming global football championship and reducing seating capacity of two stadiums, according to a document posted on Wednesday on the Russian government’s website. The document has been agreed upon with the Russian Sports Ministry as well as with the International Federation of Football Associations (FIFA) and signed by Russian Prime Minister Dmitry Medvedev. Located in Russia’s westernmost enclave, the city of Kaliningrad was selected among 11 Russia cities to host the 2018 World Cup matches and an initial football arena project envisaged a construction of a new 45,000-seat stadium for the games of the world championship. The 14,660-seat Baltika Stadium was constructed in late 19th century on money donated by philanthropist Walter Simon. At that time the stadium was located within Germany’s Konigsberg, which became Russia’s Kaliningrad after the World War II. The project for the reconstruction of the Central Stadium, built in Yekaterinburg in 1957, was submitted with the municipal authorities responsible for construction works last July and initially envisaged a 45,000-seat capacity arena. The reconstruction also stipulated the demolition of the stadium and the construction of the new arena in place of the old one. However, Russian Sports Minister Vitaly Mutko later insisted that the stadium should be renovated and not demolished and its exterior should preserve its historical look. 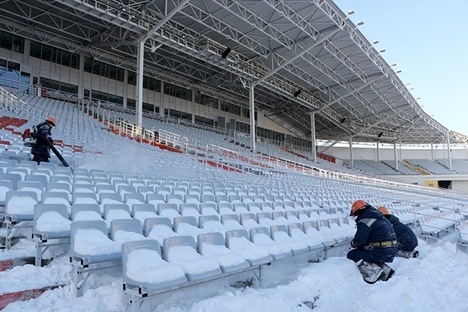 The decision to reduce the seating capacity of the stadiums in Kaliningrad and Yekaterinburg was made last summer in agreement with FIFA President Sepp Blatter and today’s document posted on the Russian government’s website was only a legal formality. Less than a month ago Mutko announced that Russia would cut its budget spending on the organization of the 2018 World Cup, but would keep its expenditures on the infrastructure and stadium construction unchanged, despite ruble volatility. According to the minister, financial programs of all departments involved in the organization of the global football championship were slashed by 10%, excluding spending items on the infrastructure. Russia’s ruble slumped over the past five months to a record low of 75 rubles to the dollar in mid-December, compared to an average of 38 rubles in September, but rebounded to 53.23 by late December. The Russian currency currently stands at almost 63 rubles to dollar. It was traded at 33 rubles to the dollar at the start of 2014. The total budget of 664.1 billion rubles for the organization of the 2018 FIFA World Cup in Russia was announced in 2012. This figure stood at $20.5 billion based on the 2012 average exchange rate. If converted to the current exchange rate this figure drops to $10.6 billion. Russian President Vladimir Putin said last August that the number of 12 stadiums in a total of 11 cities selected to host the World Cup would not be changed. The Russian president said, however, that in terms of financial spending on the World Cup preparations for Russia would be an "uneasy story," but manageable.